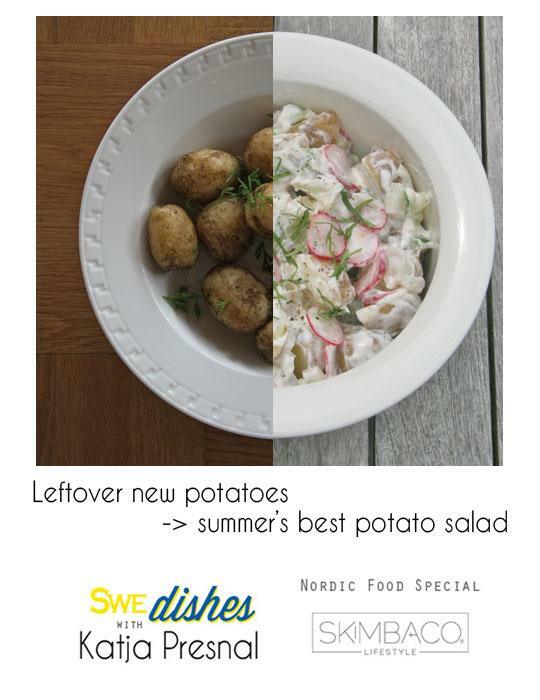 In Finland the summer food consists of uusia perunoita, silliä ja tilliä – in Sweden it’s nya potatis, sill och dill – and it is the exact same thing: new potatoes, pickled herring and fresh dill, maybe a little butter to melt on the top of the potato. Most Finns and Swedes would survive the entire new potato season with this simple dish (I would). Sometimes we grill salmon or even sausage to go with it, but I would be happy just with the dill potatoes and maybe a salad, and my dinner would be set. Since the new potatoes crown the dinner, I tend to cook too many, just in case, and in the hopes of making my second favorite new potato dish: the new potato salad with radishes. I always cook my new potatoes with fresh dill, and then add some fresh dill on the top as well. 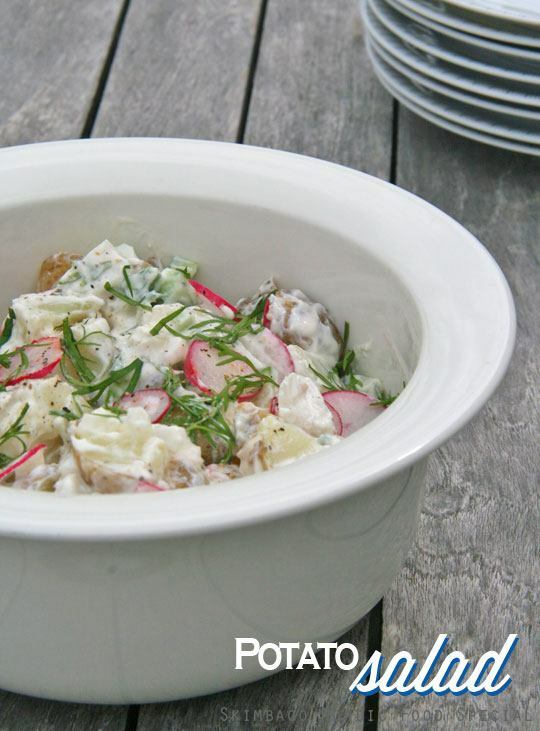 This potato salad recipe is a fresh take on traditional potato salad – no mayo, no apples and not even pickles. The entire emphasis is on fresh ingredients, directly from the farmer’s market, or your garden if you are lucky. 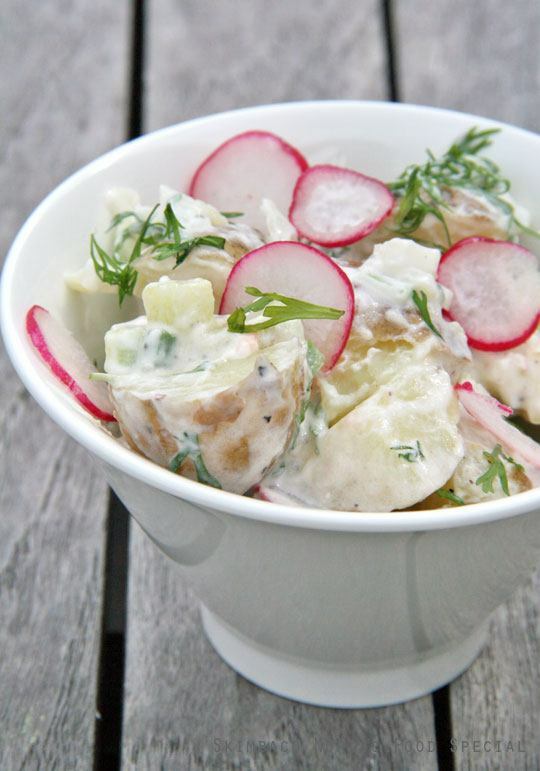 My parents have a huge garden, and when I grew up they always grew potatoes, dill, onion and radishes, and this salad truly reminds me of my childhood in Finland, and getting the summer dinner from backyard. I adjusted the ingredients to make salad for 4-6, typically the leftover potatoes yield only to 2-3. 1. Wash the potatoes well. Boil the potatoes with salt and dill, and let completely cool down, since I make this from leftover new potatoes, I typically put the potatoes on a plate in a fridge overnight and make sure there is no water on the bottom so the potatoes won’t turn soggy. Kitchen paper towel under the potatoes helps too. No need to peel these new babies. Cut the new potatoes in half or in four pieces and put in a salad bowl. 2. Slice the radishes to thin and put on a plate, sprinkle with salt and a dash of vinegar and let sit while chopping the onion and cucumber. 3. Chop the onion and English cucumber and add to the salad bowl. 4. Add crème fraîche and radishes, season with lemon pepper and fresh dill. TIPS: You can also use black pepper and squeeze some fresh lemon juice if you have lemons, but I like using lemon pepper. Don’t substitute the fresh dill to dried, and stick with English cucumbers. My family loves potato salad. I will have to share this version! This looks great. 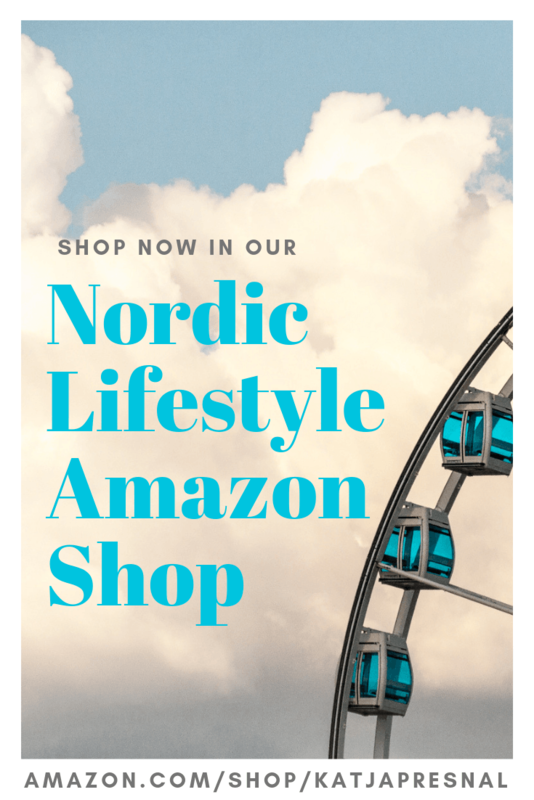 I am liking these Swedish/Finnish dishes. Thank you Leigh! It tastes “fresher” than the potato salad recipe with mayo.